In stock Order now ! Have you lost your important files and folders, you just don’t need to panic! 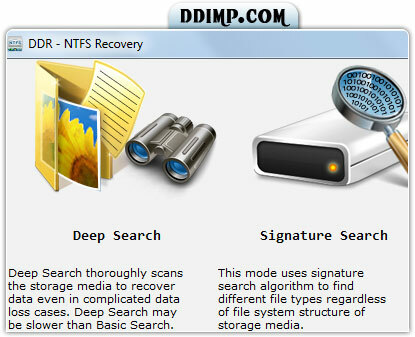 We are here to recover your data with NTFS Files Recovery Software. Utility is designed to restore deleted files and directories saved in major file formats including doc, txt, jpeg, jpg, mpeg, mp3, gif, bmp etc from fixed disk drive based on self-healing NTFS file system. Software closely scans the disk and restores data lost due to power failure, virus attack, corrupted boot sector partition, software or hardware failure, human error and other data loss reasons. Emptied Recycle bin folder or data deleted using [Shift+Delete] keys. Logical drives (volumes) are lost or missing. Formatted fixed disk drives or operating system is changed. Data corrupted due to software or hardware malfunction, virus attack, and accidental deletion etc. Data recovery from NTFS and NTFS5 file system partitioned hard disk drives. User can easily operate software without requiring any prior technical knowledge. User-friendly software with GUI interface.